For minimum possible noise, please consider using this fan with a 60mm AcoustiFan Gasket to dampen any remaining noise and vibration. I am very happy with the fan I bought. The delivery was very fast, and the whole buying process very smooth. Also, the quality of the product is what I expected. I am going to come back for more stuff for sure. I just purchased this fan to change my CCTV Dvr unit fan that was totally blown ball-bearing wise due to dust getting into the old fan unit. I must say it's silent totally worth ever buck, the only thing that i don't like is the 3 cable speed adjuster it's a minor thing overall no big deal, apart from that no complaints well hopefully one day they will make a 40mm version. This is an excellent wee fan - it spins a bit fast (up to 3,500 RPM), compared to larger fans, but it's still quiet, and at lower speeds it's virtually silent. Just picked up 2 of these to replace the two noisy stock fans in my case and I'm very impressed. My pal built my home theatre style pc 2 years ago and I recently noticed that my cpu fan was going mad. Checked temps and they were way hot. Found cpu heatsink clogged with dust. Cleaned this which brought cpu temp down and re-established cpu fan quietness. Google results told me that my temps were a little on hot side so decided to connect up the 2 stock case fans but soon realised why my friend had left them off. Still wanted to get temps down so decided to take a gamble on these 2 60mm Acoustifans. Running them at the lowest speed (5V) and I can confirm that they are absolutely silent. My PC is still as quiet as ever and my CPU, motherboard and HDD temps are all down by approx 6 to 10 deg each. Am half tempted to fit another larger Acoustifan to waft cold air in the other side of my case to improve air flow a bit more and bring those temps down even further. Thanks Quiet PC! 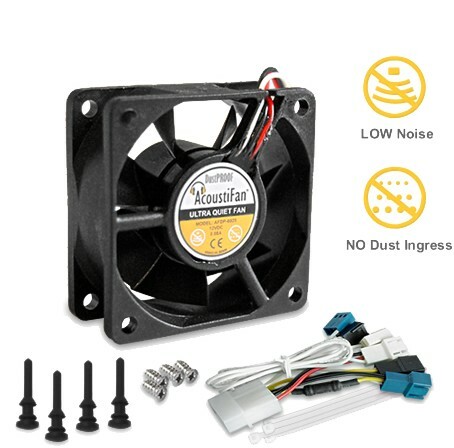 I own 2 of this fans for almost 2 years and excellent quality when cooling without to much noise (depends on the rpm you connect the fan on). Is true I didn't used them continuously , but on periods, sometimes cooling the RAM or my NB wherever I mount them did the job very well. I didn't used them continuously because my PC case inside was changed frequently so haven't need it all the time. Just 7 because instead of so many silly wires for different RPM adjustments they could easily put on an voltage divider for an much easier use and comfort for somebody who pays over 10 pounds for an 60mm fan.